Back in my Summer Camp Days, we frequently would have Taco Tuesday. It was just a fun night and a great reason to have Tacos. My usual dinner routine consists of Mexican food once per week however, it is no longer always on Tuesdays. Back in those days, the goal would be to eat as many tacos as possible. Remember, Summer Camp days consisted of 9 hours of running around – we were hungry kids. Now that I have a big girl job, I no longer have this luxury. For Cinco de Mayo, we decided that we would try the Tacos (and other items) from Taco Ardiente. 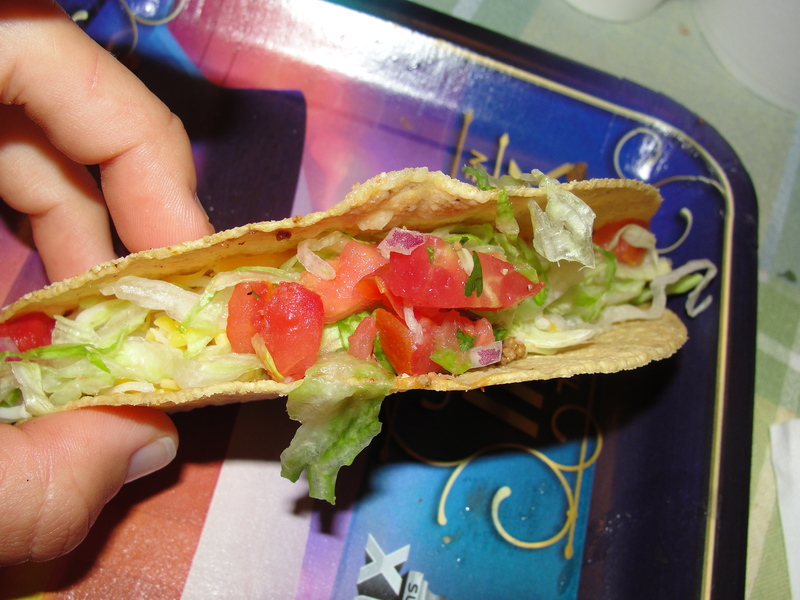 The focus on this blog will be just on the Tacos as we reminisce back to Taco Tuesday. Taco Ardiente has a location on Pine Ridge near the intersection of 41. This is a quick 5 minute drive from our house so we decided that we would take the Tacos out. Prior to this, I had never had Taco Ardiente’s tacos. I was expecting them to be somewhere between the size of a Lozanos Taco and a Taco Bell Taco. I ordered an 8 pack of hard tacos for Mommy and I to share. 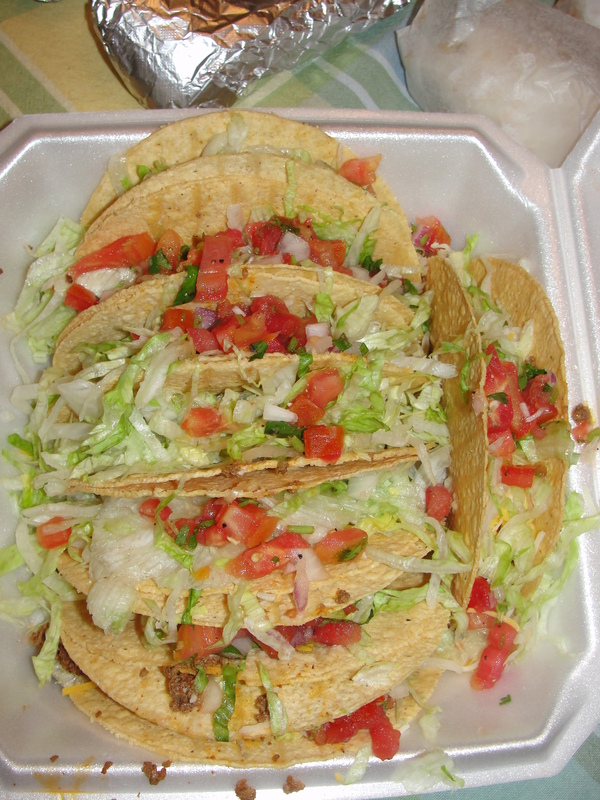 Our fillings were traditional taco – ground beef, lettuce, salsa and cheese. Taco Ardiente packed all of the tacos into a take-out box. I must say, getting 8 tacos for $5 is a pretty rocking deal. We arrived home with the tacos and I dug right in. The size was pretty much what I thought it would be – a good size indeed. The shell was quite fresh and had a subtle corn flavor. Inside, I found the ground beef to be a little bit on the skimpy side. But, for someone like me, this was perfect. I much prefer the toppings of the taco. I found the beef to taste fresh and not be loaded with sodium. The lettuce was crisp and abundant. As for the salsa, it was quite chunky and, while not quite as flavorful as Chipotle Pico, this was some good stuff. I loved the coolness of the tomatoes and how they paired with the warm beef. As for the cheese, there was nothing special about it but, it tied the whole taco together. I added some taco sauce to my tacos which made them quite delectable. Were Taco Ardiente’s tacos the best Tacos I have ever had? Well, no, not at all. But, they were good tacos for a killer price. I will certainly be visiting again and ordering more tacos. We did also try a variety of other items, which were also good and for a fab price. Our total bill was $25 and we got A LOT of food. Stay tuned for more on that. If you are in Naples, and want a taco that is fresher than Taco Bell, Taco Ardiente is for you. Great service and fresh tasting food, makes this a go-to place. While Taco Ardiente will never be a Taco Tuesday, after a glorious day of Summer Camp, I do appreciate it allowing me to reflect back…if only for a moment. The Nachos are delish!! Great toppings.